EDINBURG — Beto O’Rourke had just debated U.S. Sen. Ted Cruz for the first time — not an easy assignment, the congressman from El Paso noted — so he came to the part of the state he perhaps feels most comfortable: the Texas-Mexico border. Instead of typical Rio Grande Valley weekend barbecues at home, there was a large one in the parking lot of the Social Club in Edinburg on Sunday. While masses waited to enter the building, multiple mobile barbecue pits cooked chicken and tortillas while Tejano music streamed from inside. Babies, teens and adults sported O’Rourke apparel while others bought more gear at pop-up stands. One man wore a red “Make America Great Again” hat, the same one President Trump regularly wears at his campaign events. 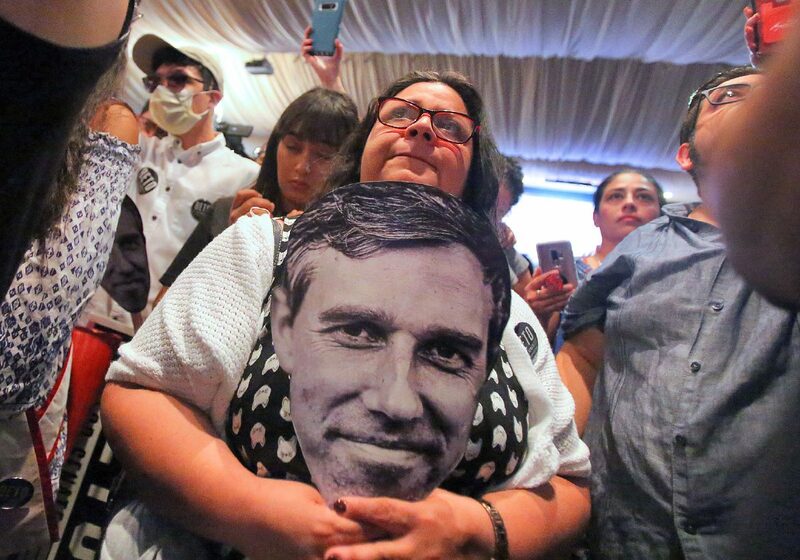 This has not been a regular sight at O’Rourke’s rallies in South Texas, a Democratic stronghold. Lalo Martinez, a Cruz fan, wanted to survey the scene and take some pictures to post on social media and send to Republican friends in hopes of mobilizing the Valley’s weak Republican party. Supporter Angelica Vaquez listens to U.S. Rep. Beto O'Rourke, D-El Paso, the democratic candidate for U.S. Senate, as he speaks during a campaign stop Sunday, Sept. 23, 2018, at The Social Club in Edinburg. 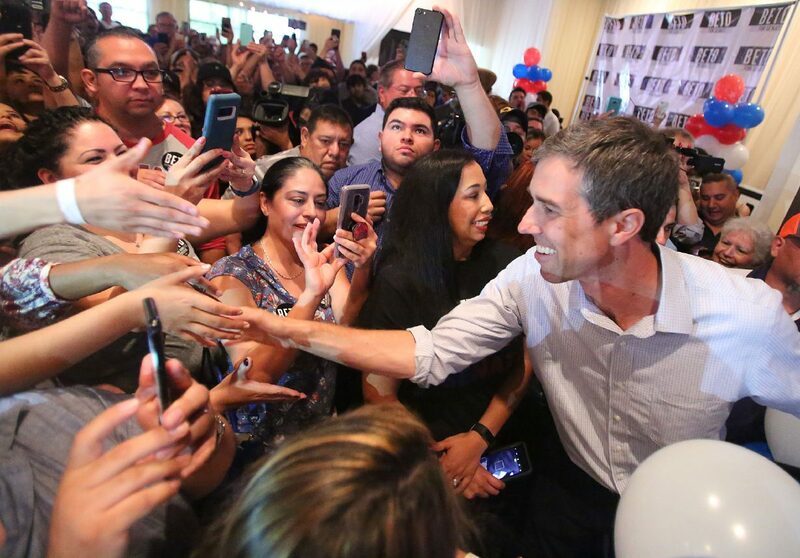 The O’Rourke campaign said 2,000 people were in attendance inside and out on Sunday to see O’Rourke, as well as Joaquin and Julian Castro, who introduced O’Rourke with help from State Sen. Juan “Chuy” Hinojosa, D-McAllen. Political analysts have said that a strong South Texas showing could be necessary for O’Rourke to have a good shot of unseating Cruz. O’Rourke’s crowds here have exponentially increased in recent visits, and after Sunday’s event he said the afternoon’s crowd compared to that of one in Dallas or Houston. Scores of people held up phones to record video of him throughout the speech. Afterward, when O’Rourke was walking back to his minivan, groups of people ran after him. O’Rourke has one more trip to the Valley planned for Oct. 18, when he’ll hold a CNN town hall. Between now and then, O’Rourke and Cruz will debate two more times — once in Houston and another in San Antonio. Friday’s debate in Dallas featured a focus, in part, on immigration. O’Rourke discussed the hundreds of thousands of unauthorized young immigrants who have come to be known as “Dreamers” at length at Sunday’s rally. Edinburg and the Valley is the front door to the U.S., he said. Earlier, Joaquin Castro said O’Rourke’s opponent doesn’t understand this concept. Cruz knocked O’Rourke during the debate for focusing more on the lives of illegal immigrants than on U.S. citizens. O’Rourke said he supports granting citizenship to the Dreamers, who have been put in limbo since Trump took office. Repeated applause rang out when O’Rourke continued talking about welcoming immigrants peacefully into the country, and when ripping the border wall. O’Rourke called Cruz “that other candidate” when he talked about the wall. Cruz, meanwhile, has tried to display distinct differences between them on as many issues as possible, such as law enforcement support and immigration. O’Rourke has tried to neglect party affiliation, even with his own Democrats, in hopes of appealing to all.